Thảo luận trong 'ENGLISH' bắt đầu bởi Rin Ehlers Sheldon, 10/2/19. We came; we shivered; we Sundanced. We saw as many films as possible in 10 days. The snow has settled, and we’ve had some time to process what we watched. Attending Sundance is a gift that gives all year, because the films projected linger in your consciousness long after you’ve left Park City. Audiences in 2019 will likely share the sentiments of so many we encountered in ticket-holder and waitlist lines at this film festival. The world is already in pretty shaky shape. We’re not really looking for films that make us feel the outlook is bleak. If we’re going to be devastated by our entertainment, we better learn something from it, and that lesson better not be that people are awful and that life is trivial. Thankfully, this year’s crop of features should leave you feeling fairly inspired to get out there and RISK INDEPENDENCE. Here are the ones we think filmmakers will be especially excited to see. 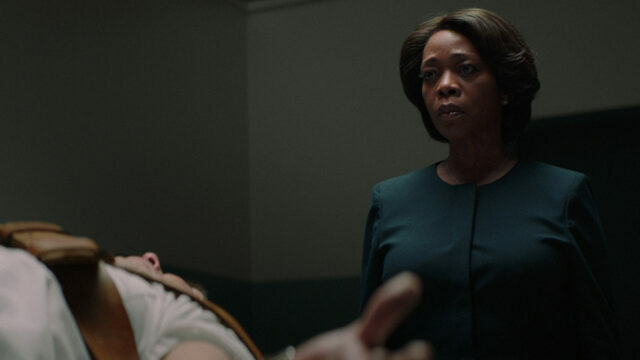 Alfre Woodard in Clemency. Image Courtesy of The Sundance Institute. 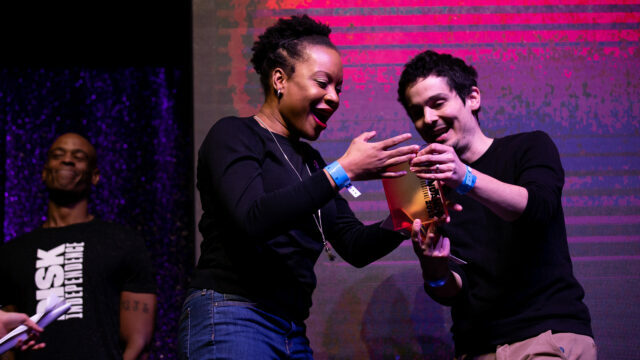 Written and directed by Chinonye Chukwu, this film took home the Grand Jury Prize for the U.S Dramatic films at the festival. The Grand Jury Prize can really be taken home by any film that makes it into Sundance, depending on who makes up the jury, and how they are impacted by the narrative, but Clemency is not just any film. It is a parable of Social justice and a masterful first feature from Chukwu. Alfre Woodard and Aldis Hodge give unforgettably raw and intimate performances as Chukwu’s script takes a submarine into the darkest of human experiences. This is not your typical death-row drama. We see how capital punishment infects the lives of everyone who comes into contact with the person condemned: the ones whose fingerprints are left on the hangman’s noose, the ones whose memories are burdened with countless absent stares. From the very beginning, we see how an executioner’s threshold for witnessing death can give way, forcing the examination of how long a person can “follow orders” and relinquish ownership of his or her own actions. Just as compelling is the pushing of that inner pressure on a person’s home life. The filmmaking of Clemency is not necessarily innovative, but it perfectly suits the story in it’s stillness. Chukwu’s true triumph is in her cultivation of deep empathy for a protagonist in the most dismal of settings. Words from a Bear. Image Courtesy of the Sundance Institute. 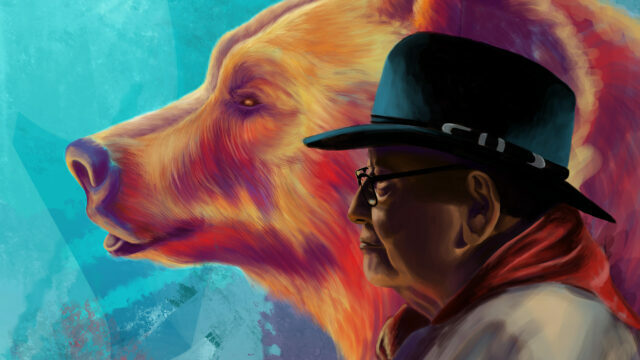 Telling the tale of N. Scott Momaday’s epic life and career is no small task. Director Jeffrey Palmer seamlessly weaves drone, animation, re-enactment, interviews, recitations, and archival footage into a loving tribute to this Pulitzer-prized wordsmith. There is such a strong p.o.v in the filmmaking, yet it harmoniously honors the individuality of N. Scott Momaday as a painter and a poet. This is one of those movies where all of its moving parts are so thoughtfully tinkered that the machine at large gives you pause in wonder. There are so many assets on the timeline, this very easily could have come out in a giant jumble, but instead it’s this symphony played in honor of someone’s efforts and existence. This is the kind of documentary that every jaded filmmaker should watch and learn what comes out of dedicating your craft to a subject you truly love. If you’re stuck in a cycle of making the same old somethings to meet your mortgage, this is the movie you need to watch to remind yourself of what telling a true story can do for your audience and your artistry. 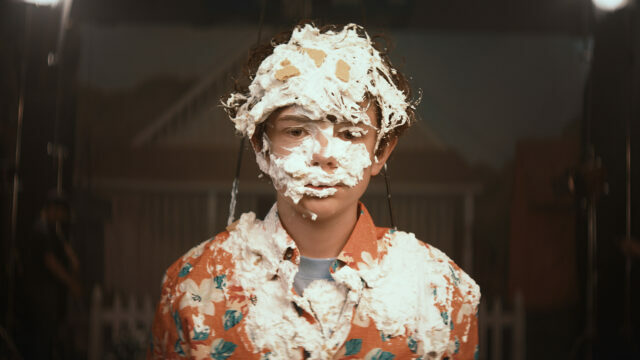 Noah Jupe as Young Otis in Honey Boy. Image Courtesy of The Sundance Institute. This film, written by Shia LeBoeuf and directed by Alma Ha’rel may not have taken home the Audience award, but it was by far and away the film most talked about on buses and in ticket lines. LeBeouf and Noah Jupe, leap off of the screen in a narrative about the horribly messy and inescapable bond of parent and child. The film is reflective without being indulgent as LeBoeuf’s script rewinds to his break-through years in Hollywood. There’s much that can be said about this film in regards to the recovery narrative, but so much of the punch this story packs is in the subtext and the performances delivering it. How much of what we do to others, especially those we love, is an attempt to satisfy what we cannot do for ourselves? How can that motivation help, and how does it harm? Every writer should watch this film for a reminder of how not to talk down to your audience. Honey Boy has a great deal of highly specific dialogue that doesn’t dumb itself down with exposition or explanation; the emotional context is enough. It is a remarkable first screenplay from LeBeouf that is so deeply personal, you find yourself aching and reaching for the characters’ healing right alongside them. A story of grit and determination, Knock Down the House won the Audience Award for U.S. Documentary. Director Rachel Lears follows the journey of four women running for Congress. This doc does not lean on bells and whistles. This is good old-fashioned journalistic filmmaking at its best. The edit intercuts these four women’s lives in a year so stress charged, you may end up blowing a circuit when you get the chance to stream it. The moments chosen to represent their individual campaigns leave us with an intimate look at the ingredients for courage. Personal tragedy and frustration become the fuel that propels these women through the difficulty of taking their lives into the public eye and daring to better their worlds. Even if you’re personal beliefs don’t align with this doc’s subjects, there can be no doubt that when the credits scroll, you will be struck by the power of the individual in pursuit of making a difference. Justin Chon’s and Ante Cheng’s sophomore effort as a Director/DP duo will get you right in the gut. Lensed almost entirely with the Todd-ao 55 anamorphic, Ms. Purple is a beautifully shot drama about a young woman doing whatever she can to keep her father alive, while trying to reconnect with her brother in the process. While most viewers have probably never had to work as a doumi girl in a karaoke bar, this is a story that rings so tightly true, the audience relates to the protagonist from beginning to end. It is a story of trying to keep in touch with the best of who you are, while being chipped away by your misguided choices. This movie examines how far one can go in an impossible situation before having to surrender to what is larger than self. It’s about keeping the individual spirit intact through the connection of family. The audience is riveted to a world with which they are likely unfamiliar, through a plot that is funny, terrifying, heartbreaking, suspenseful, devastating, and then SOMEHOW also hopeful. The cinematography is bold and brave, striking the perfect balance of elevating the story without distracting from it. Even with a few pretty drastic changes in frame rate, every shot is emotionally justified. Tiffany Chu and Teddy Lee may not be on your radar yet, but their performances in this film reveal them as the kind of artists that will draw you to the theatre to see what they do next. If you only see one movie from Sundance this year, this should be the one. There you have it, the top 5 from where I sit. However, in an effort not to snub some truly great cinema, here are a few more you-really-should-see movies from Sundance 2019. Hala and Big Time Adolescence are two coming-of age stories that couldn’t be more different. Watch BTA for a full belly laugh and Hala for full blown catharsis. Both are sincere, fresh looks at the teenage experience with phenomenal casts and direction: definitely worth your time and cost of admission. Them That Follow, The Sound of Silence, and The Tomorrow Man are the films to seek out when you feel exhausted by the content available to you. These are films with plot lines you have NEVER seen before… ever. Them That Follow is a gripping edge-of-your-seat drama that takes your heart racing through an Appalachian snake-handling community. (It’s also one of three films that Jim Gaffigan is in, King of Sundance 2019.) The Sound of Silence is a New York-centric film that follows a “house-tuner,” also known as a dude that stabilizes your emotional life by balancing audio anomalies in your home, who falls into a (sort of) romance with one of his clients… you need to see this for the sound design alone. It’s deliciously odd, and Rashida Jones is pretty perfect. The Tomorrow Man follows a doomsday hoarder and a hoarder-hoarder as they fall in love. Blythe Danner and John Lithgow are charming as the leads. They approach their characters with such care, they make the fringe of society look like the place to be. Late Night starring Mindy Kaling and Emma Thompson is a thoroughly satisfying comedy with a feel-good finish. Seek out this flick when it feels like the world is against you…or really on any day when you want to take your empathy out for a good stretch of the legs. There’s a reason Amazon swept this up fast for a record breaking amount of cash: audiences want to laugh right now. Sonja the White Swan is a salacious period biopic, revolving around an anti-heroine, who has a classic, but oh so juicy tragic flaw. The anachronisms in the score and the cinematography are a real treat as you watch someone destroy the world that has been laid at her ice-skate clad feet. Lastly, The Report is a political thriller that will leave you outraged at the real life events that inspire the story and wholly impressed with Adam Driver and Annette Benning… in case you were one of the four people on earth who weren’t already. The post Sundance 2019: The Films that Will Enrich Your Year appeared first on cinema5D.